My new experiment suggests that the bokeh difference lessens as the degree of macro increases. This first setup is probably at about the same subject magnification as the thread (probably a bit less magnification) As you can see I obviously have an error in my measurements because the apsc(K01) is a little less magnified. Difficult to now where to measure to - I sort of measured to the lens centre and maybe it should have been to the sensor plane. Anyway if the apsc had been a little closer as it should have been then the bokeh would have been a little smoother again. Think there is not much difference between the two. So subjective!!. 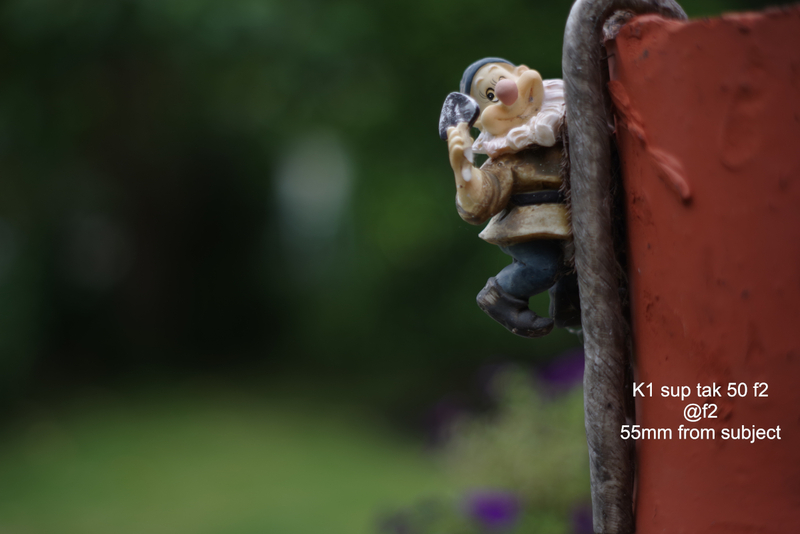 And lastly with the 55mm f1.8 further away. Here the difference in smoothness is a little more obvious. Distances here was a la footometre so approx. I suggest using a ruler as your subject and picking two points as your top of frame and bottom of frame reference marks. Line up on those to ensure subjects are correctly sized. Then change backgrounds. Also keep your angles as close to the same as possible. This shows how hard it is to get nearly identical shots. They are very similar. Yes it is probably simpler to do it that way. I think my error is from the fact the FF is closer to the subject and therefore the lens is that bit further from the sensor - it makes the calculation a little more complex. i’d say that the difference is clearly to be seen with these last shots. also wide open bokehballs are equal. 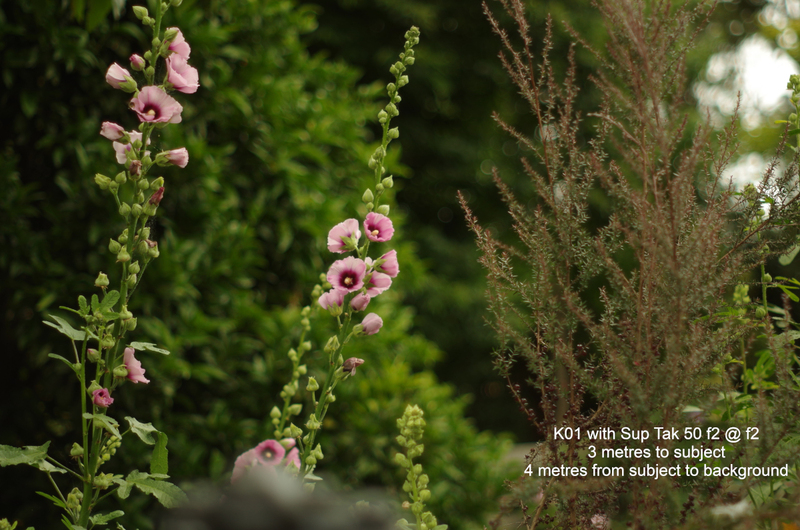 DoF is not ’that’ much different, but it is also clearly visible. also if you look bokeh, background is more blurred and even with almost similar Fov there is wider background and not as much compression. one example is that white thing at background. a pole? it is more profound in K01 and it is in different place too. all is more centered. those are the things what comes with FF. it would be interesting to see similar FoV lenses, like 50 for FF and 35 for crop. then you could also see that dof thing more clearly and have roughly similar composition. Ok here is the same background done with a ruler. It was slightly sunnier with the K01 shot. (as if there wasn't enough variables already! )Ex camera jpgs. Note the purple in the lower right. That is some flowers about 700mm away. Almost no difference in the blur of them. I think this is about as objective as you can get comparing the bokehs. That is great comparision shot. As you can clearly see the difference. edit. also numbers look bigger in FF picture but that is part of the deal, when you 'match' the FoV. Numbers should be the same size if I have done it right!. I printed the K01 caption in smaller font because it was on a smaller sized image. Still got it wrong and I think that may be why you think the ruler numbers are different. Things like the texture size in the background may or may not create a sort of interference pattern with the aperture. 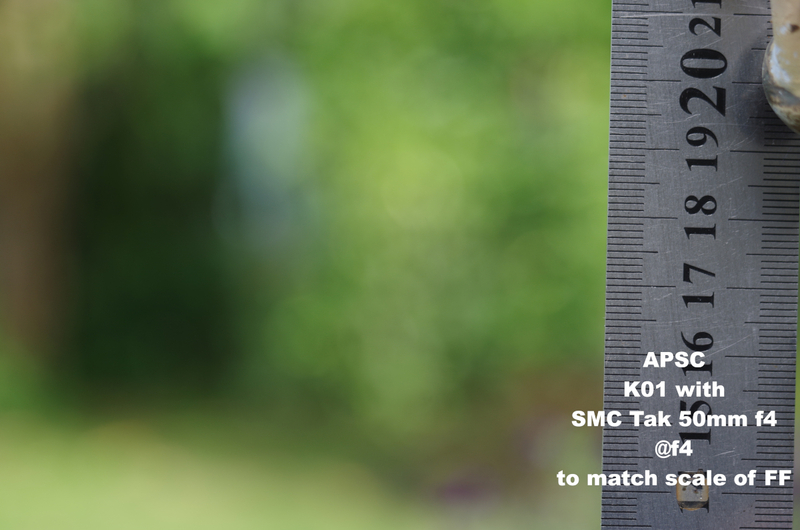 A background like the original thread image that has a simpler centre area lends itself to a smoother bokeh in apsc. 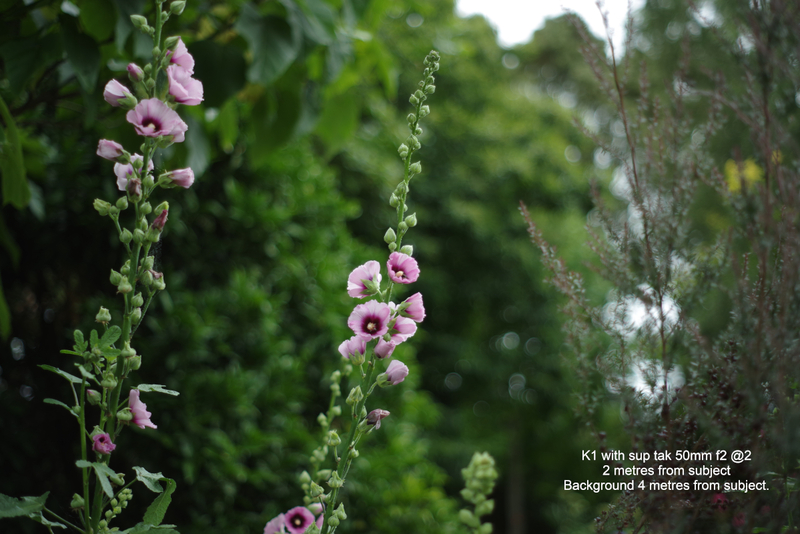 All this means there is no one simple outcome for smoother bokeh. That is pretty well what I was thinking. With the addition that pulling back on the FF and expecting to crop in pp will have the same outcome. 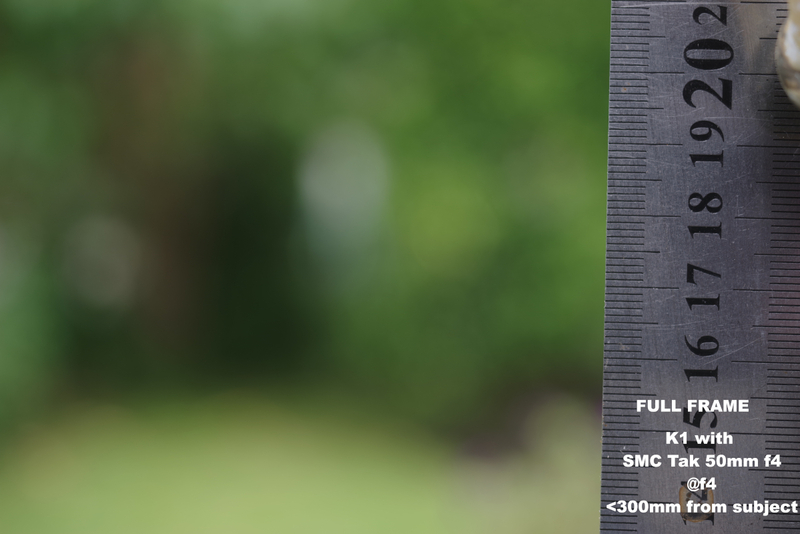 The thing is that for macro with 55 or 50 on aps-c you should use about 80-85 mm macro with FF, it greatly gain benefit to FF. Added lenght would give more DoF, and you could stop lens down more, and still have butter Oof. But if you shoot with same lens and try by cropping get similar look, it is not possible and you will loose some resolution on the way. 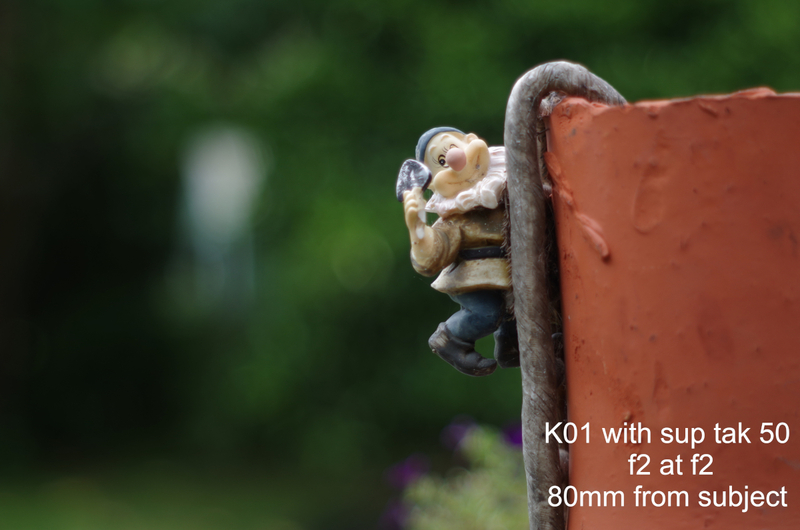 As I said, use 50 mm on FF and 35 on crop, and you'll see benefit of FF with DoF. Using similar f stop. But I agree that the above doesn't apply to the degree of blur of oof areas where the longer focal lengths excel. I’m bendin, but with in the ’rules’. 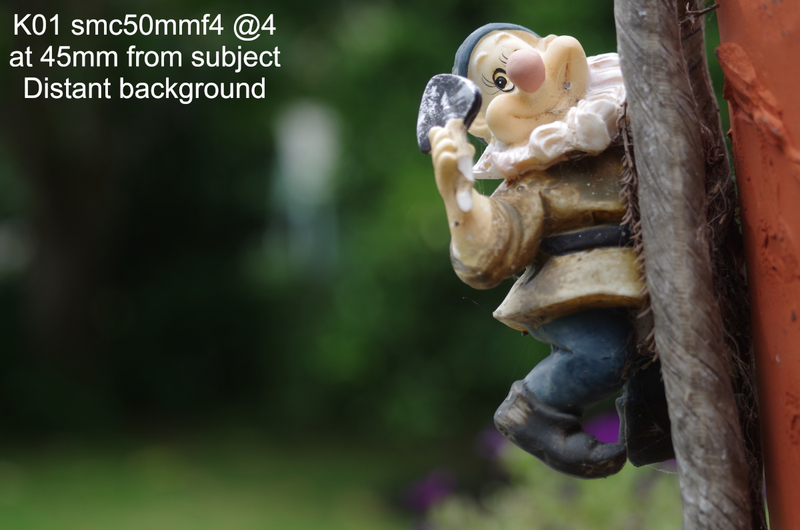 With crop 50 mm is tele and with FF it is normal focal. I have been actually quite surprised how my f 28, FA 43, Fa 35 and DA*55 did change when I did put them on FF. I’m still time to time surprised. Also my 90/2,4 macro did the same. I ’knew’ it before, but when you see it your self, then you realise it. I have been really looking the differenses before this and can spot them quite well. 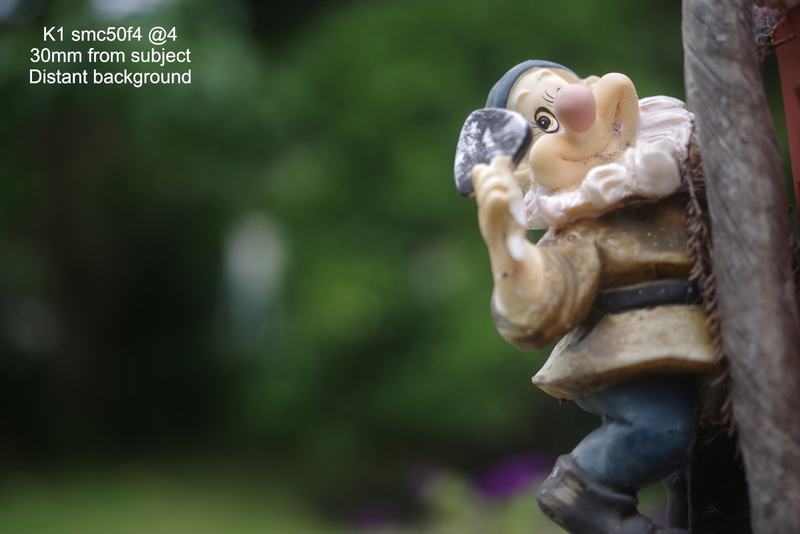 Bokeh is one thing, and as you said Dof is the same. But, blur is not and how much things you get in the frame. Your las 2 images are great example of that. The difference in Dof surprised me too. Suddenly those nice closeup bokeh shots taken wide open were that much harder to get right - to the extent that I have felt the need to stop down a bit which kind of takes away the point of having the nice old fast glass like the 50 1.4s.. And only now have I realised that I was not getting the presumed gain of a smoother bokeh. Don't get me wrong - every thing else with the old glass on the K1 is superb.